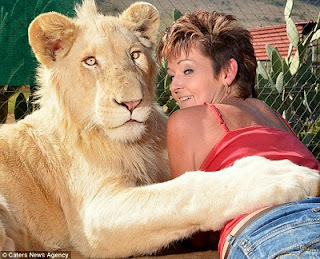 Animal lover Annel Snyman and her pet cat Timba exemplify the incredible bond that can grow between man and beast. But Timba is no ordinary house cat. He’s a hulking house lion that can polish of 9lbs of raw meat a day and could bite off her head any time he liked. But Timba is really a big softie, and loves nothing more than to cuddle up to Annel on the sofa of their home in the Waterburg region of South Africa. Timba, who is one year and six months old, also enjoys going for walks with Annel’s six-year-old dog, Diesel and ‘helping out’ with everyday chores around the house. And as these remarkable pictures show, Annel has now formed an incredible bond with the 120kg lion, after adopting him as a cub in March last year. The 31-year-old, who lives in the Waterberg region of South Africa, just outside Bela-Bela, said she loved her unconventional pet. She said: ‘Family and friends have all had to adjust to the occasional tackle by a large cat while visiting. They’ve also gotten used to having him investigating their coffee or any other sweet items they happen to have. As a cub Timba could often be found snoozing in Annel’s bed but having outgrown the bedroom the friendly feline still tries to cuddle up with Annel on the sofa. She said: ‘Relationships used to be a challenge as there was often some jealousy issues about who was going to snuggle up with who on the couch. It normally ended up with me on one couch with Timba snuggled up on my lap and the other person on the other couch or outside looking rather concerned. ‘This was something that Timba had mastered perfectly. He used to be fantastic at subtly shifting his way onto the couch between myself and whoever was sitting next to me. ‘If only every father could have a lion to keep the boys away from their daughters. ‘I’m in a relationship now though and thankfully Timba has totally accepted my partner as one of the family. What do you think about this strange and strong bond with a wild animal? Is it a cute and special thing to happen, or she is just waiting to be a cute and special meal?